Time Code is a useful way to integrate time synchronization across devices in order to synchronize the equipment with each other. Small messages will be sent in regular intervals and every device thereby knows the overall time of the system. ▪ If such a time code is sent in the network, through MADRIX USB SMPTE or through other interfaces, they will be received by MADRIX if the feature is activated as explained below. You need to activate your MIDI device in MADRIX and activate MTC reception. MADRIX will automatically search for connected devices. Your MIDI device will be shown in the list. ▪ You might want to work with another software that sends MIDI Time Code. ▪ Often, that also means that you want to run MADRIX and the other software on one computer. ▪ Various 3rd-party programs are available to create virtual MIDI devices and use them to connect MADRIX and the other software. ▪ To send Art-Net Time Code, it is recommended to use the MADRIX Time Code Sender, separate tool that is automatically installed together with MADRIX. ▪ To receive Art-Net Time Code, you need to activate Art-Net first. 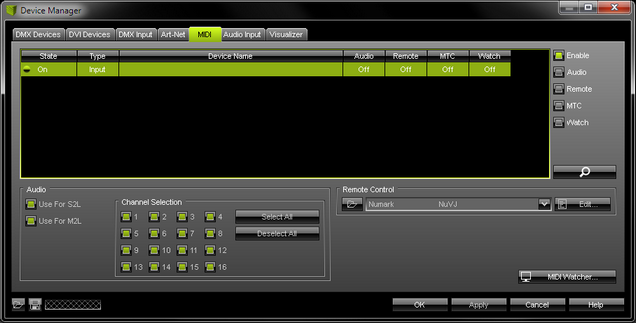 ▪ The MADRIX USB SMPTE hardware interface allows you to receive SMPTE time code with MADRIX. ▪ You can use the clock of your computer to generate Time Code. You can use Time Code in the Cue List. ▪ MADRIX will automatically start receiving external Time Code. ▪ Configure the column Time Code for your Cue List entries. ▪ Add or edit more entries according to your requirements.